Check and healthcare payments ripe for adoption of new technologies. 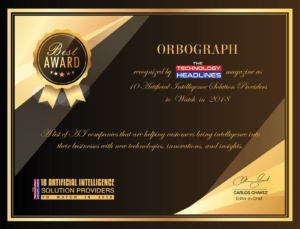 Billerica, MA, February 15, 2018 – OrboGraph, a premier developer and supplier of intelligent electronic and paper automation leveraging recognition technologies, image validation and check fraud detection for the U.S. check processing and healthcare revenue cycle markets, was recently highlighted in the February edition of The TECHNOLOGY HEADLINES: “Top 10 Artificial Intelligence (AI) Solution Providers to Watch in 2018”. Artificial Intelligence investment will reach around $150 billion by 2030 across major industries such as automotive, banking and healthcare. 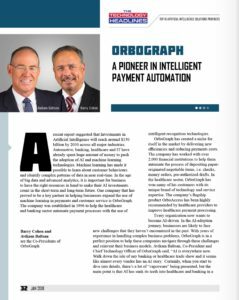 OrboGraph’s focus is to automate payments via Intelligent Payment Automation technology. The company looks at AI to improve efficiencies into the entire payment mix and facilitate electronification of payments, which ultimately reduces payment costs. “AI is everywhere now. Walk down the isle of any banking or healthcare trade show and it seems like almost every vendor has an AI story. Certainly, when you start to dive into details, there’s a lot of “vaporware” being presented, but the main point is that AI has sunk its teeth into healthcare and banking in a big way,” stated OrboGraph Co-President and CTO, Avikam Baltsan. OrboGraph article available for viewing in PDF. The TECHNOLOGY HEADLINES publication can be viewed online. OrboGraph (www.orbograph.com), a subsidiary of Orbotech, is a premier developer and supplier of intelligent electronic/paper automation solutions in healthcare revenue cycle management (RCM), as well as recognition solutions, payment negotiability and check fraud detection for the U.S. check processing market. The company mantra, “intelligent payment automation,” describes how intelligent technologies are applied so payment posting becomes an automated process and information is accessed and analyzed via a variety of business intelligence, analytics and user interface capabilities. Nearly 4,000 financial institutions, service bureaus, clearinghouses, and billers rely on OrboGraph technology to process billions of checks, EOBs, correspondence letters and claims annually.